Sweet, sticky and lip-smackingly good. These beans are incredibly easy to make and well worth the effort to make from scratch, rather than simply opening a can of ready-made. While they bake, uncovered, the sauce on top caramelizes and thickens as it darkens in color adding a richer flavor that you can stir through the whole before serving. Drain and rinse the beans, then place into a large pot. Cover beans by 4 inches with water, add the piece of kombu, and bring to a boil. 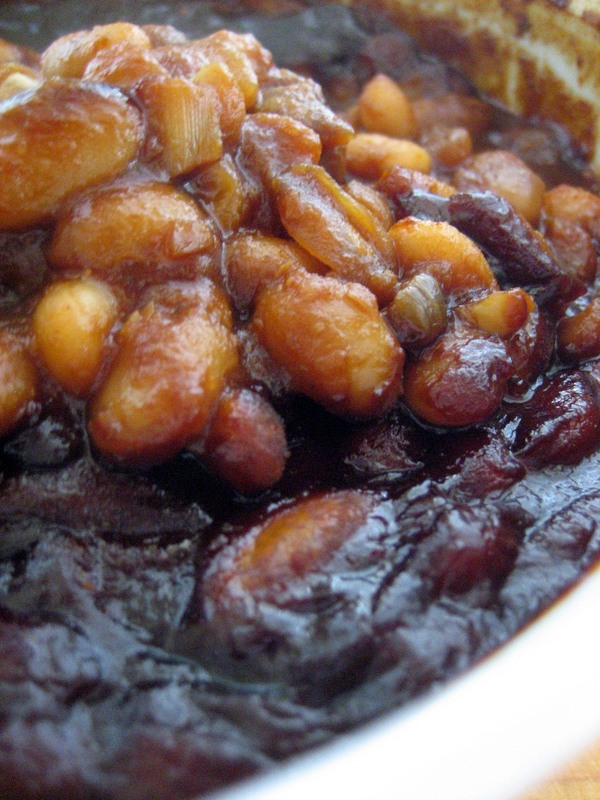 Reduce heat to medium and simmer for an hour to an hour and a half, until the beans soften. While the beans are simmering, sauté the onion in a drizzle of olive oil until translucent. Add the garlic and tomato paste. Continue cooking until the tomato paste has slightly caramelized. Add the remaining ingredients and mix well. Set aside. Drain the beans, reserving 2 cups of cooking liquid. Return the beans and reserved cooking liquid to the pot. Add the sauce and mix thoroughly. Transfer to a large oven-safe crock and bake, uncovered, for an hour. These were wonderful! I followed the recipe to the letter with the exception of the kombu (did not have it). The fam loved it, but I had a lot left over. Will it freeze well? We’re still on the road, so I’m responding via my cell phone. I’m so glad that you dug them! As to freezing, I hope they do because I too have a freezer full of them awaiting our return from vacation. So, short answer is…I hope so and will find out in a few days. Just an update for ya. I thawed them last night and am having them for dinner again tonight. They froze/thawed beautifully. Made these tonight for dinner w/out the kumbo as well and they were quite good. I have tons leftover too of course but tomorrow night I am making a bean/fakin bacon chowder and cornbread. That will use up some of them. That’s wonderful, I’m very happy that you liked them. The reason I cook the beans with kombu is to mitigate the after-effects of eating beans. This recipe does make a lot of beans. I figured that it’s barbecue and get-together season so they would most likely be made for a crowd.